The holidays are upon us again and I have so much to be grateful for. First and foremost, I would like to thank all of you for being part of our compassionate community. I appreciate all your comments and feedback and the generosity you show me when you share my recipes with your friends and family. You inspire me to do better and I hope I never disappoint. This is also a good time of the year to be reflective and think about the things you want to change. My goal for 2015 is to continue sharing delicious, healthy, plant-based recipes and hopefully inspire you to make health and wellness your #1 priority. If you are overweight and/or suffering from a food-related disease like type-2 diabetes or heart disease, don't beat yourself up. Many times our food environment plays a significant role in our chronic disease, and many neighborhoods, work settings and schools influence which foods are available and affordable to us. Always remember, it is never too late to change the way you eat and improve your health. 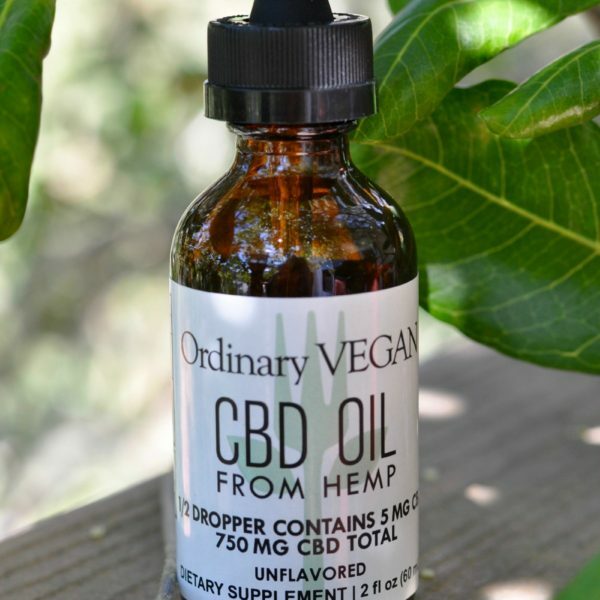 I also want to say today that we welcome everyone to this blog. You don't have to be a full-time vegan to enjoy these recipes and make an impact on your health, animal welfare and the environment. Every plant-based meal helps. 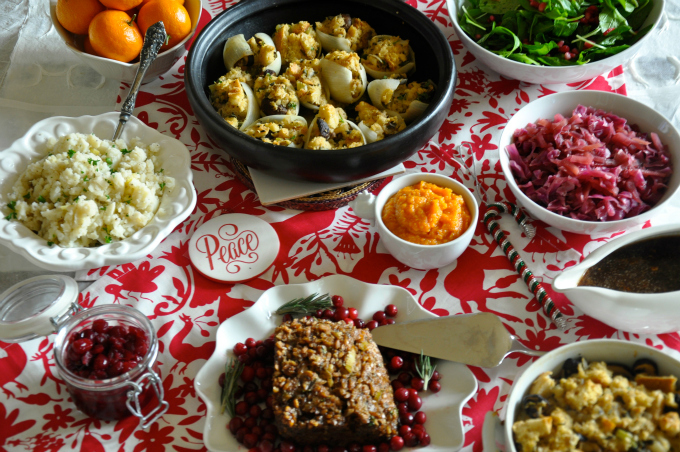 I hope your holidays are full of compassion, peace, health and delicious plant-based food. Now on to this year's vegan Thanksgiving recipes. Whew. 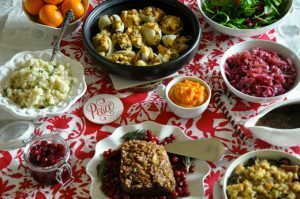 I did a lot of experimenting before coming up with some of these vegan Thanksgiving recipes. My first goal was to create a vegan holiday loaf that was protein packed without using lentils. I like lentils ok but most holiday loafs are packed with them and I wanted to try something different this year so I used farro as my protein. If you are not familiar with farro, it is a healthy Italian grain with a nutty flavor that is rich in fiber, protein, magnesium and B vitamins. The only downside of farro is that it is unsuitable for people with a gluten intolerance. I combined the grain with many familiar holiday flavors so it does have a similar taste to stuffing. If you are going to serve both, I suggest the roasted mushroom recipe below which has a smokey flavor from the vegan bacon and a strong roasting flavor from the mushrooms. 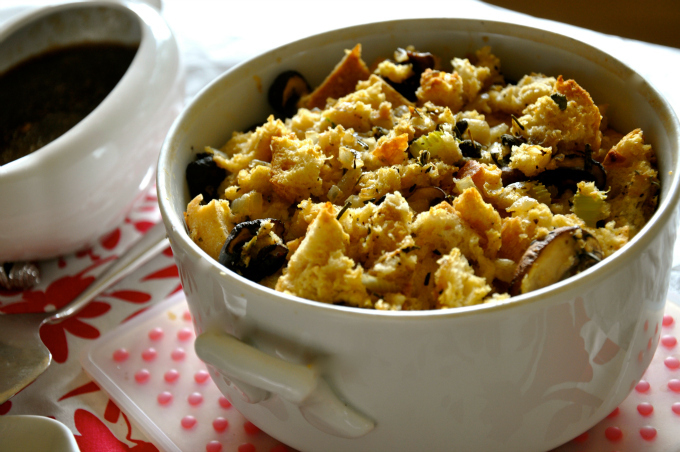 It is a good combination because the stuffing tastes entirely different from the vegan holiday loaf. Each year I like to create a fun presentation for the stuffing and this year I baked it stuffed in onions. This idea was inspired from a stuffed onion recipe I saw in the amazing vegetarian cookbook, Plenty, by Yotam Ottolenghi. As far as sides go, I like traditional. Mashed potatoes with leeks, green bean casserole, brussels sprouts and this year I did a quick and easy pickled cranberry sauce. I thought the tartness of the cranberries would create a good balance to the sweet side dishes. 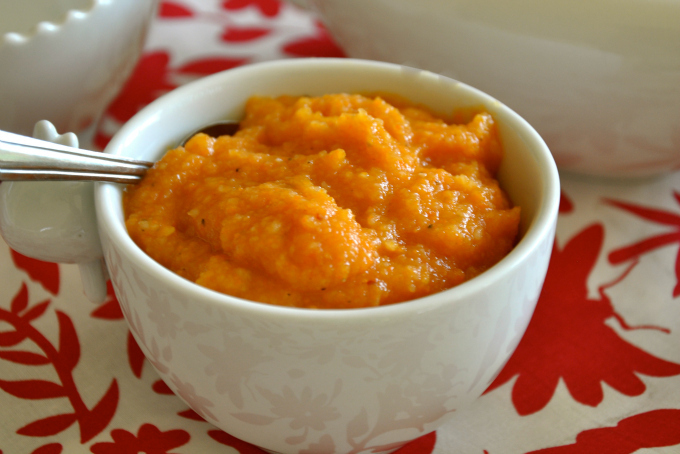 I also made a carrot turnip sauce which went well with the holiday loaf and sweet and sour cabbage for the intense red color and taste. Aside from the pickled cranberry ingredients, I tried to stick with four fresh herbs for all the recipes which were sage, rosemary, thyme and parsley. I know vegan Thanksgiving recipes can get costly, and buying a lot of expensive ingredients is never my goal. Also, something to remember, sweet potatoes, onions and cabbage are all on the clean list which means those vegetables have little or no trace of pesticides even when they aren't organic. Knowing when you can buy non-organic can also help save a few dollars on your vegan Thanksgiving recipes. Hope you enjoy these healthy, vegan Thanksgiving recipes as much as I did. 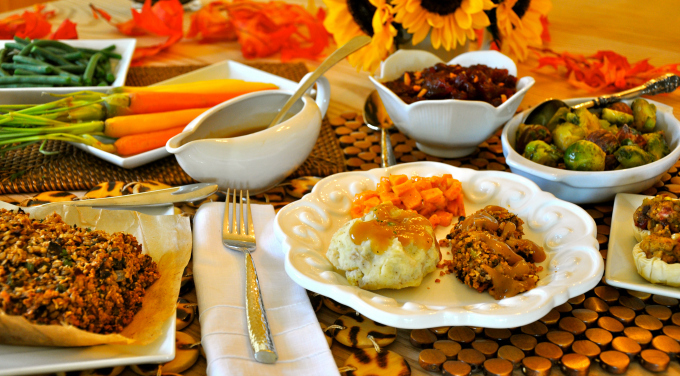 If you are looking for more holiday ideas, check out Ordinary Vegan's Thanksgiving 2014 and Vegan Thanksgiving 2013. Or check-out the ultimate holiday showstopper, Vegan Roast Wellington with Lentils, Mushrooms and Chestnuts. 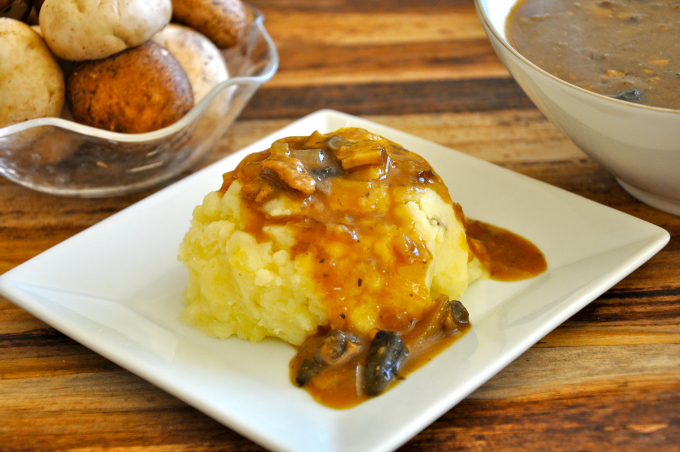 And in my humble opinion, here is a recipe for the best vegan gravy you will ever taste! 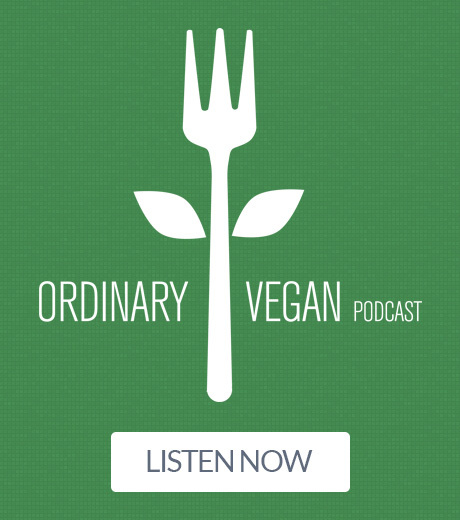 Don't miss any of Ordinary Vegan's recipes by signing up here.. Just getting started on a plant-based diet? 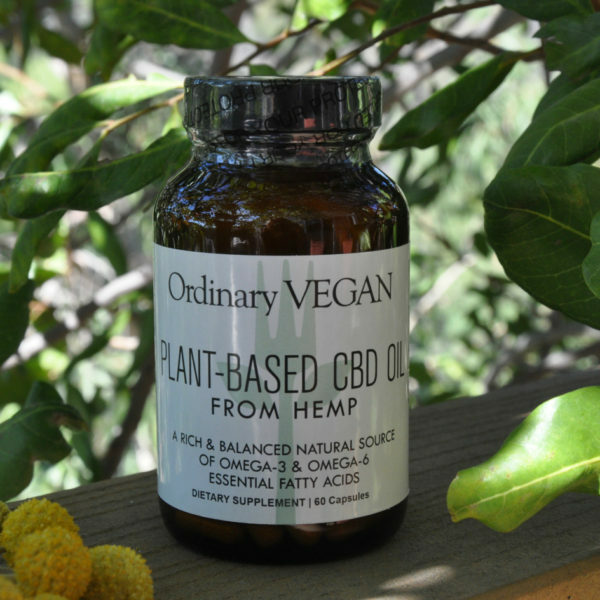 Here is a free downloadable list of delicious vegan protein. Also, please join or community on Facebook. It is fun and full of wonderful, compassionate people like you. Even though the accompaniments to my vegan Thanksgiving are delicious, I still like to serve a protein loaf during the holidays. This year I tried making a loaf from one of my favorite grains called farro. Farro is easy to find and very healthy. This high-protein loaf, although delicious, tasted similar to stuffing because of the holiday traditional ingredients, so if you are cooking for a small crowd, you might not need to also make stuffing. Also, I used my favorite brown sugar mustard glaze - you could also reduce some maple syrup on the stove and brush that on top instead. Rinse and drain 1½ cups of organic farro. Place in a pot and add enough water or vegetable stock to cover. Bring to a boil, reduce heat to medium-low and simmer for approximately 25-30 minutes. Drain off any excess water. Heat the vegetable broth or vegan butter in a large saute pan. When hot, toss in the onions and celery. Cook for 3-4 minutes or until softened. Add the garlic, salt, pepper and herbs and cook for another minute. Add more vegetable broth if sticking. Remove from heat. Place the walnuts in a food processor and process until crumbly. Place the pineapple in a food processor and process until smooth. There will still be a few overy small pieces. Place the farro in a large bowl. Add the cooled onion mix, walnuts, pineapple, dijon mustard, salt, pepper, herbs and flax eggs. Add a light sprinkle of red pepper flakes if using. Combine with your hands. Taste for additional seasonings. Start adding the bread crumbs until it holds together. Adding more bread crumbs if necessary. Place the mixture in a loaf pan. Cook for 15 minutes. Remove and brush with glaze and cook for another 15-20 minutes. Serve with mashed potatoes and gravy. Whisk together the brown sugar, vinegar and dijon mustard. 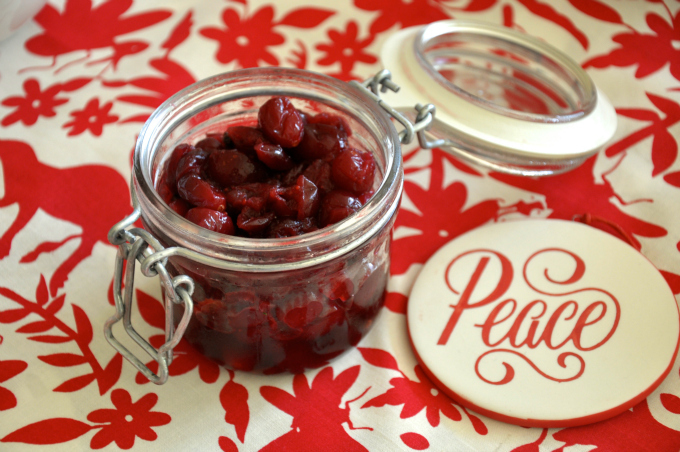 When cooking a vegan holiday dinner, I like to experience a lot of different layers of flavor so I thought I would try something different this year and try this pickled cranberry recipe. This is a quick and easy pickling process but does use some ingredients you might not have around your home. Also, a little goes a long way. In a medium saucepan, combine the vinegar, water and maple syrup and bring to a boil. Reduce the heat and add the cinnamon, cloves, star anise, orange zest and ginger. Cover and simmer gently for 10 minutes. add the cranberries to the liquid and bring to a simmer. As soon as it reaches the simmer again, remove fro heat. Pour the cranberries and liquid into a glass bowl. Cover and refrigerate for at least a day to give the flavors time to develop. The cranberries will last for up to a week. 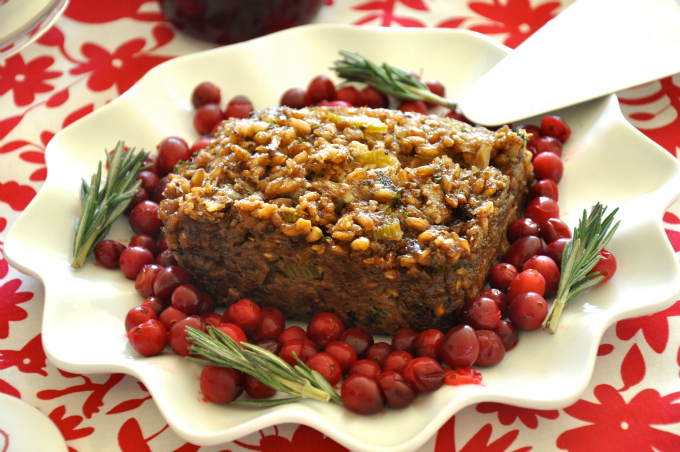 Serve a small dollop on a plate of vegan Thanksgiving loaf. I like to switch up my stuffing presentation. This year I presented it in stuffed onions. Remove the brown skin and cut the bottom and top of the onion. Slice down the side and without breaking the skin, remove the single layer. The skin layer was softened by placing them in simmering vegetable broth for 3-4 minutes until tender and then drained. I filled each onion layer with stuffing and placed the stuffed onions, seam-side down into a baking dish. I added a cup of stock on the bottom for moisture and baked covered for about 40-50 minutes. 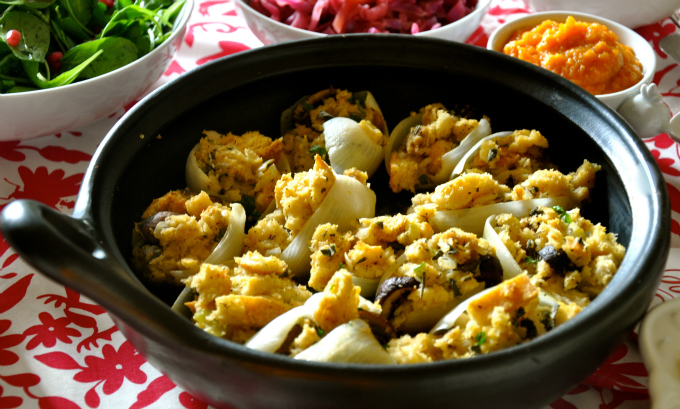 This stuffed onion idea is inspired by the cookbook recipe "stuffed onions" from Plenty by Yotam Ottolenghi. I also cooked it the traditional way which is in the instructions. Spread the bread onto a large baking sheet in an even layer and bake, until lightly golden brown, about 10 minutes, stirring occasionally. Remove and let cool. Increase the oven to 375 degrees F. Place the sliced mushrooms into a large baking dish or baking sheet. Drizzle with olive oil and sprinkle with salt and pepper. Roast, stirring occasionally, until soft and golden brown, about 20-25 minutes. Meanwhile, heat 2 tablespoons of vegetable broth or vegan butter in a large saute pan. Add the onion and celery and cook until soft. Add more broth if sticking. Add the garlic and cook another 1 minute. Add 3 cups of the vegetable broth, herbs, salt and pepper and bring to a light simmer and immediately remove from heat. Place the bread cubes into a large bowl. Add the the mushrooms and juices, onion celery stock, vegan bacon if using and flax eggs and gently stir until combined. The dressing should be moist but not soggy. It takes a couple of minutes for the liquid to absorb the bread so give it a couple of minutes before you add more vegetable stock. Taste and adjust seasonings. Place the mixture into a greased 13 by 9 baking dish. Cover with aluminum foil and bake for 20 minutes. Remove the foil and continue baking until the top is golden brown about 30-35 minutes longer. 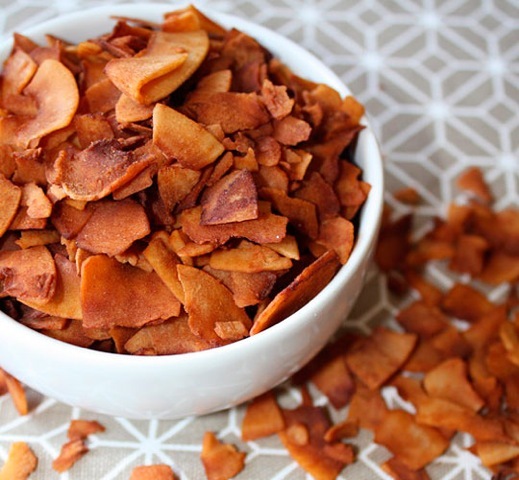 Use the leftover coconut bacon as an appetizer much like you would serve nuts with cocktails. In a large bowl, combine the liguid smoke, soy sauce, maple syrup, water and pepper. Pour in the the flaked coconut, gently stirring until the coconut is evenly coated. Place the coconut mixture on a baking sheet in an even layer and place into the oven. Bake for 20-25 minutes, flipping the bacon every 5 minutes until it cooks evenly and it a crispy medium brown not dark. Keep a close eye on it so it doesn't get too dark. 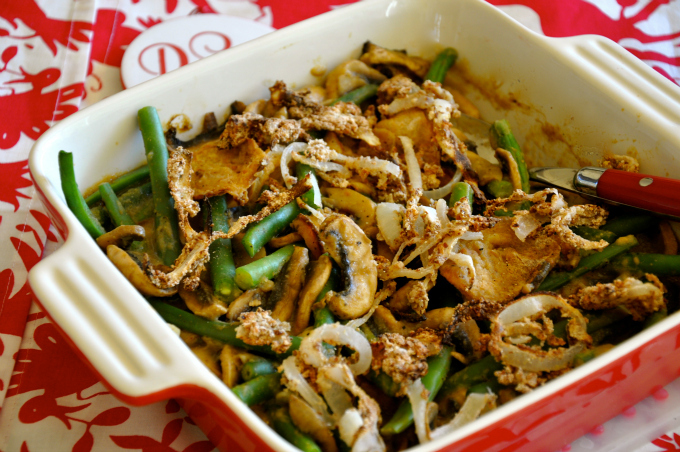 This reminds me of the green bean casseroles we grew up on but this is a much healthier version. Pre-heat the ovenn to 400 degrees F.
Make flax eggs by combining 3 tablespoons of ground flax seed whisked with 9 tablespoons of water. Put in refrigerator for 15 minutes or more to thicken. Place in a bowl. Combine bread crumbs in a medium size bowl with salt, pepper and cayenne if using. Place onion rings in a large resealable plastic bag. Add the flour to the bag and shake until the rings are well coated. Drop the flour-coated rings into the flax egg mixture bowl until coated. Add the rings to the vegan bread crumbs and toss until coated with crumbs. Transfer the coated onion rings to a large baking sheet covered in parchment paper or lightly oiled. Bake until the onion rings are tender and the crumbs are a golden brown, approximately 15 minutes, turning once. Boil a large pot of water with a teaspoon of salt. Add the beans and blanch for 5 minutes. Drain and rinse in cold water to stop cooking. Drain and set aside. You can also steam them for 3-5 minutes. Heat the 4 tablespoons of vegetable broth, salt and ground black pepper in a large saute pan over medium heat. Add the mushrooms and cook, stirring occasionally for approximately 5 minutes. Add more broth if sticking but give the mushroom a minute to release their own juices. Add the garlic and nutmeg and cook for another minute. Sprinkle the flour over the mixture, stir and cook for another minute. Add the vegetable broth and bring to a simmer. Decrease the heat and add the non-dairy milk. Cook until the mixture thickens, stirring for approximately 5-7 minutes. Remove fro the heat and stir in a handful of the onion rings and green beans. Transfer to a casserole dish. Top with ½ cup of onion rings or more to taste and bake at 375 degrees F until bubbling, approximately 15 minutes. Serve immediately. I like this simple preperation for my Brussels sprouts. If you want to make them a bit more festive, add ½ tablespoon of dark brown sugar when you add the butter at the end. Heat vegetable stock, salt and pepper in a large saute pan. 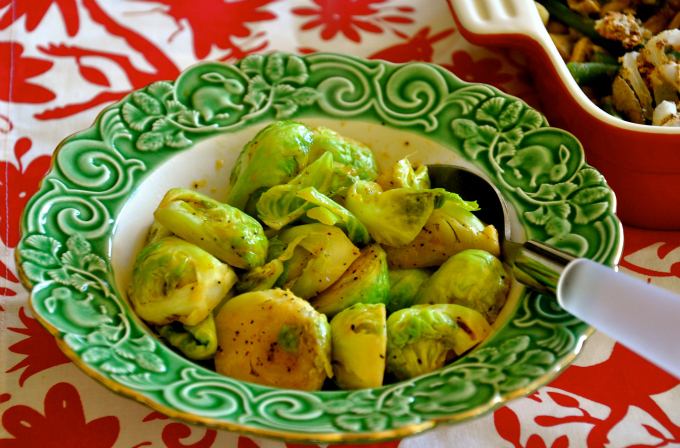 Add the brussels sprouts and cook until tender and bright green. Add more stock if needed, stirring often. In the last few minutes of cooking, add the butter if using and cook until the undersides of the Brussels sprouts are caramelized a touch with a nice brown color. Serve with a sprinkle of parsley or lemon wedges. This sauce really tastes delicious with any vegan nut loaf etc. 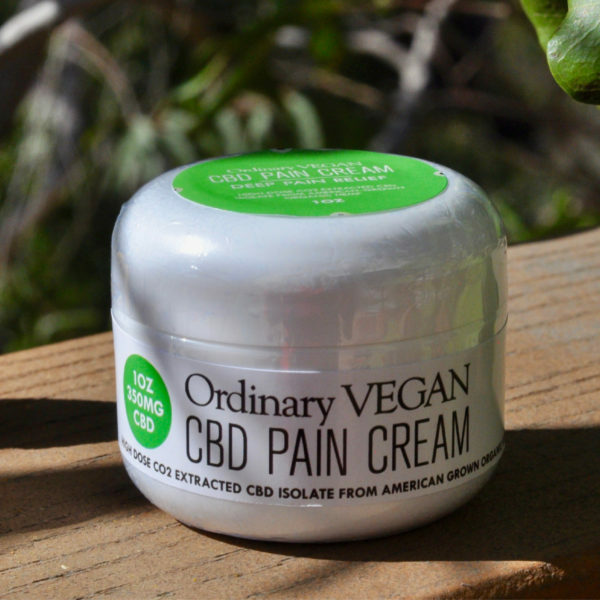 Just spread on a plate and place a piece of your vegan loaf on top. Sprinkle with parsley. Place the parsnips, carrots, onion and vegetable broth in a medium baking dish. Sprinkle with the salt and pepper. Add the bay leaf and fresh thyme. Pour the vegetable broth over the top and cover with aluminum foil and bake for approximately 30-40 minutes or until the vegetables are very soft. Discard the bay leaf and thyme sprigs if using. In a blender or food processor, blend the vegetable mixture until smooth. Stir in the parlsey. Taste and adjust seasonings. If you want it thicker, you can always add a teaspoon of tapioca starch (or cornstarch). Transfer to a small saucepan and heat until warm. Serve as a side or ladled onto a plate and topped with your favorite vegan loaf. 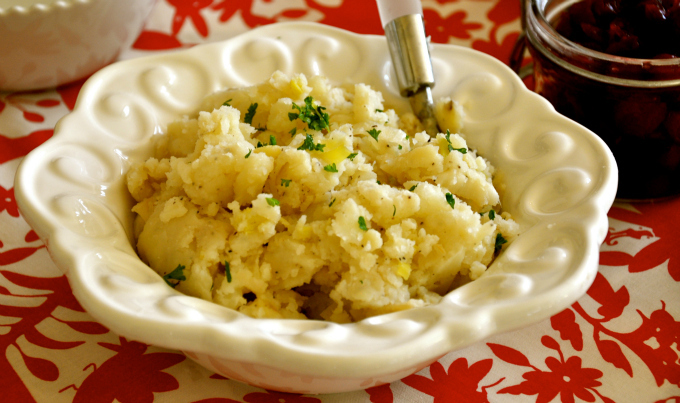 I love the addition of leeks in mashed potatoes. You could also add a tablespoon of minced garlic. 1½ - 2 lbs of yellow or russet potatoes, peeled and chopped into equal sizes. In a saucepan, heat the vegetable broth or vegan butter if using over medium heat. Add the leeks and sauce for 3-5 minutes until softened. Add the potatoes, ay leaf, salt and pepper. Add water to just cover the vegetables. Bring to a boil over high heat. Reduce the heat and simmer for 20-25 minutes or until the potatoes are fork tender. Drain and discard bay leaf. With a potato masher, mash the potato and leek mixture until smooth. Add the unflavored non-dairy milk for a creamier texture. Serve with my mushroom gravy ladled on top. Add the red wine and cook one minute, stirring constantly. Stir in remaining 3 cups of broth and fresh herbs. Bring to a boil, reduce heat and simmer. I love adding a red vegetable when I am cooking a holiday meal. Beets are also a nice choice. In a large saucepan, combine the all the ingredients except the cabbage and apples. Bring to a boil, add the cabbage, reduce the heat and simmer partially covered for 30 minutes. Add the apples and simmer, uncovered for another 20 minutes. Remove from heat and let stand for 20 minutes. Discard the bay leaf and the cloves. Taste and season with more salt and pepper if needed. Serve. Sometimes time management gets the best of me and when that happens I like to roast my vegetables with familiar holiday seasonings like this roasted green bean recipe with sage. Preheat oven to 375 degrees F. Place the beans on a large rimmed baking sheet. Sprinkle with salt and pepper. Roast beans, stirring occasionally for 10 minutes. Add scallions, garlic and herbs and cook for another 10 minutes or until beans are cooked. Where is the dessert? Pumpkin Pie or cheesecake? Hi Sharon – Haven’t decided on the dessert yet – I was thinking of a simple blackberry cobbler but I like your ideas just as much! Hi Moya, Happy Thanksgiving and thanks for the kind words. It is definitely never too late to make changes to your health and life. New changes bring wonderful things and every plant-based meal will give you new energy and a new perspective. I am writing a cookbook / how-to book and hope to publish it next year. In the meantime I suggest some basic books about health with some easy recipes like Forks Over Knives. Good luck Moya and thanks for being part of our community!